#26. 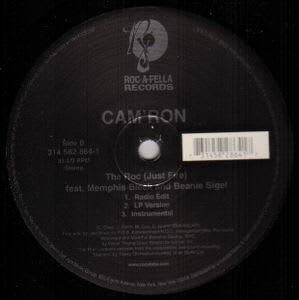 Cam'ron f/ Memphis Bleek and Beanie Sigel "The Roc (Just Fire)"
The first track released following Cam's deal with Roc-A-Fella, this posse cut hinted at the potential serendipity of the combined East Coast movements. Bleek is his typical workmanlike, unremarkable self, but the real treat here is seeing syllable-wranglers like Beans and Cam'ron flipping strings of syllables like pies. Good times.